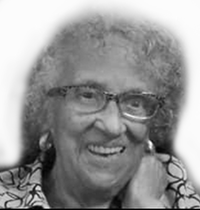 Augustus Funeral Home regrets to announce the passing of Mrs. Florence Elise Virgil. A Home Going service for Mrs. Florence Elise Virgil, beloved wife of the late Oscar Virgil, daughter of the late Charles and Madeline Ingham, loving mother to Sharon and the late Merylyn, sister to the late Leonard, Carl, Clair and Iona, in her 98th year of 35 Town Hill Road, Flatts will be held at The Jehovah’s Witness, Kingdom Hall, Ewing Street, Hamilton Today, January 21, 2019 at 2:00 pm. Interment will follow the service at Pembroke Parish Cemetery. Lovingly remembered by grandchildren: Shane [Kennette], Omar [Jo-Ell], Kijana, Bakari Robinson, Howard, Nicholas and Stephanie Moore of the USA; great-grandchildren: Chiara, Shane, Shayla, Kylie, Kaiden; sons-in-law: Howard Moore, Dilton Robinson; sisters-in-law: Loraine Ingham, Francis Virgil, Ruth Pemberton; nieces: Noreen, Cheryl, Wendy, Sandra, Brenda; nephews: Charles, Myron, Derek, Raymond, Desmond; special friends: Pam Smith, The Branco Family, Joyce Smith and Family, Jackie Kent, Aaron Tucker, Roslyn Furbert, The Jehovah’s Witness Family and numerous other friends and family.